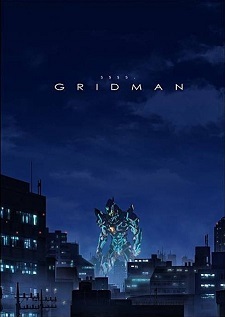 The SSSS.Gridman stage event at Tokyo Comic Con announced lead cast and main staff members for the upcoming anime series on Saturday. Directed by Akira Amemiya (Inferno Cop, Kill la Kill assistant director) at studio Trigger in collaboration with Tsuburaya Productions, the anime is scheduled to premiere in Fall 2018. But I was thinking about their previous shows. @ronie91 You kind of did. And I know who you were talking about. That's it? Man I just wanted atleast some animation to see if it's CG or not. They've used some, but it's really well hidden. And it's Amemiya not Imaishi. i know the second part of the footage was from Nihon Animator Expo, but i always thought that was Ultraman or something. Not... whatever this is. Nope, the expo short was Gridman. But there was one about The Ultraman, an anime and manga from the 70s. I was a little surprised that in the PV they showed animations of the series in Anime Expo, and in this key visual the designer seems very different from the likes of Amemiya. It's more for an "Evangelion style" [designer and color] than for a more Gurren Lagann type. Let's see how it goes: Akira Amemiya is a veteran and Trigger is reliable. It's more of a Ultraman Orb style, designed by the same guy who is working on this project. Not sure where you got GL from. Not to waste time, I will not even answer your question. It was very clear that I was talking about the designer. I normally wouldnt but their new show in january even if its not a mecha centered show has CGI mechs so i wont really feel right saying they are a beacon of hope until they release another TV mecha series. Aw, PV looks quite disappointing. And I had high hopes from Trigger. We didn't got much about it aside from a script writer and the PV which doesn't have much content. Eh, I guess. Tokusatsu anime? Lol, what's going on? Heck, did I just saw Optimus Prime in there? I need more PV so I would know if I should watch this or not. So this one is going to be a darker remake of the franchise, I guess? And is that CGI? Fall 2018, need to wait longer.